Workman Publishing Company, 9780761139638, 992pp. 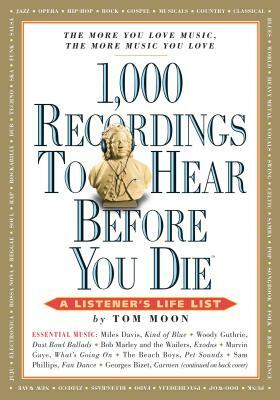 One thing I learned in researching 1000 Recordings To Hear Before You Die was that there's a big difference between listening with full attention and having music on in the background. In this way, the act of listening is much different from the act of reading. When was the last time you listened to a piece of music without doing several other things? What did you take away from that experience? What happens when you apply a "reader's focus" – attention to the details of narrative, writerly nuance, recurring devices, etc. – to an exploration of music? Does music always reflect the era of its creation? When we hear baroque music, we're often transported to a particular period – to the point where we can "see" the gowns in the ornate ballroom, in much the way a historical novel sets a scene. But what about compositions that date slightly later, and are not so tethered to a particular image? Is it possible for a performer to interpret Mozart's piano works as "living music," so that the music feels somehow contemporary? What does it take to bring a century-old composition alive? One of my goals in compiling 1000 Recordings was to celebrate peak musical experiences from all over the world – there are records from Africa, Brazil, Cuba, the Far East, etc. In many cases, the lyrics are in languages other than English. At times, the words can be cryptic or impossible to discern, and often, therefore, not easily translated. Does this change the experience? Should it? Is knowing the meaning of a "text" essential to the appreciation of music? One important step in becoming a discerning reader or listener has to do with understanding what you don't like. Many people react to music on a purely visceral level; they're either swooning or covering their ears before the piece has ended. It's possible to get the sense of a piece of music within minutes, but it can often take longer to fathom the intricacies and ideas that drive a novel. Does this time-investment difference affect the way we perceive different artistic expressions? Are we more willing to stick with a challenging read for longer than we would a challenging piece of music?